If your genealogy software program doesn't allow you to design the type of chart that you'd like printed, we can use your GEDCOM file as source material and do the chart design for you. Although not all genealogy software programs allow you to design your own charts for printing, virtually all genealogy software programs will allow you export your data as a GEDCOM file. If you're a member of a genealogy social networking sites like Ancestry.com, Geni, My Heritage or Tribal Pages, and have your genealogy data stored on one of these services, please also visit our page about these genealogy social networking sites. Your first choice should always be to purchase a genealogy program such as Family Tree Maker and do the design work yourself. You can easily import your existing GEDCOM file into Family Tree Maker and be ready to do your own design work in a matter of minutes. 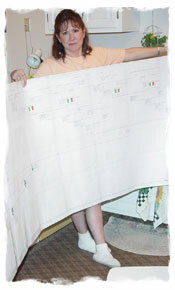 Family Tree Maker is relatively inexpensive, and sells for about $40 online at ancestry.com. If for some reason you don't want to do this, simply send us your GEDCOM file and we can do it for you. Our layout and design charges are $45. Our normal family tree printing charges will be in addition to this design fee. If additional work or corrections to your data is required, additional charges will apply. If your chart is already designed and print-ready, this design fee does not apply. If you need assistance in designing your genealogy chart, simply send or e-mail us your GEDCOM file. After we import your GEDCOM file into Family Tree Maker and design your chart, we will send you a preview of what your chart will look like for you to proof prior to printing. Depending upon the dimensions of your chart, the preview will be either an Adobe Acrobat PDF file or a screen shot in jpeg format which we will send you as an e-mail attachment. The Adobe Acrobat reader software is free if you don't already have it. After you give us your OK, we will then proceed with printing your family tree chart. Here are some examples of charts which we can design for you if you're not designing your own chart. Please call us at 630-653-8400 or e-mail us at sales@ancestryprinting.com if you have any questions about getting your family tree chart printed from your existing GEDCOM file. International callers can also Skype us if preferred; however, we ask that you email us to set up a convenient time for a Skype to Skype call. We are located in the central time zone of the U.S. (GMT/UTC-6 and -5 in the summer), and can make arrangements for incoming Skype to Skype calls up to around 10:00 PM local time on most nights. We only accept Skype to Skype calls that have been pre-arranged by email. And, if you haven't already done so please watch the video about our services.